Want to hear a great story? If you saw John and Julia’s testimonial, you got to see their amazing home. What wasn’t included is the rich history behind the house. To begin, finding John and Julia’s house is no easy task. Going from county highway to county highway, you have to find the right turn into what appears to be a driveway. After 100 ft, I realize that there is still a distance to go with tall maple, and well established oak trees on either side, the sun hitting the ground in small patches. Somewhere on this winding route, my GPS steers me wrong, and suddenly my car is looking over a cliff. Recognizing something wasn’t quite right, a brief phone call to John realigned me, and my VW Jetta crept around the last winding corner. Perched in front of me amongst the thick green canopy a sloping roof and a circular driveway welcomed me in. This home has been in the family for generations. It began as a small home, “just the living room and two or three bedrooms upstairs. No heat, no plumbing. Just a bunkhouse,” John describes. He points up the hill to an old stone staircase where the house had been moved from in 1929. “Instead of starting over, they rolled it down the hill?” I asked, mind boggled. “That’s what you did in the 20’s” John answered matter-of-factly. I imagine hardworking Americans hiking up and down a steep hill, worthy of downhill skiing, every day to get water and swim. Suddenly, my winding drive seems a lot shorter and easier than ten minutes go. The history of the house only gets more rich. Julia describes, “when they moved this house, they picked it up, and it was sort of rotten along the bottom, and so they sawed off the bottom of the house and now our windows go to the floor.” Chuckling at this fact, Julia continues that during the remodeling they “for sure” wanted to have the windows stay the same the quirkiness of the new design feature was not to be lost in the remodel. Not only is the history of the home fascinating, but intertwined with the family history it is clear why John and Julia care so much for this project. Hillcrest Builders played an enormous role in making maintaining the integrity of the home, while simultaneously updating it for John and Julia’s needs. “Oyvind sot of got what we were trying to do instantly… So we trusted him from the very beginning and his sense of the aesthetic we were going for.” John stated confidently noting that they kept light fixtures, the old glass, all the hardwood, and the staircase (which has a story all its own). Remodeling was clearly a dynamic conversation between the Hillcrest team and team John and Julia. John and Julia had great things to say about all the team members. “We worked with Tim on the design of the building, he had some good ideas on how to add interest, and the roof line is what we really love most. Heather, we worked with to make selections in terms of colors and cabinets and floor and almost anything you can imagine, siding, gutters. That part was very well organized. After hearing John and Julia’s process, I can see why people say remodeling is harder than building new. Simultaneously, I can see all the love, time, and history that the next generation will be so lucky to receive wrapped up and perched on top of a hill, overlooking a lake, in the middle of Wisconsin. 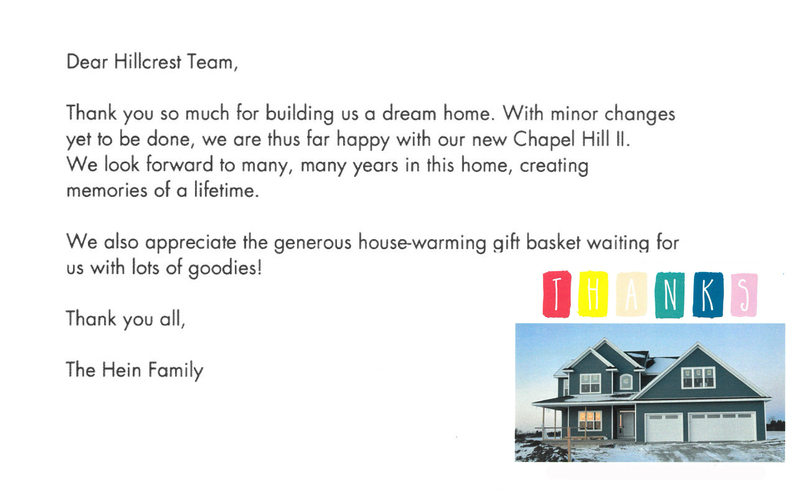 We wanted to share this thank you note written to Hillcrest. We are so blessed to have such great customers. Thank you Hein Family.